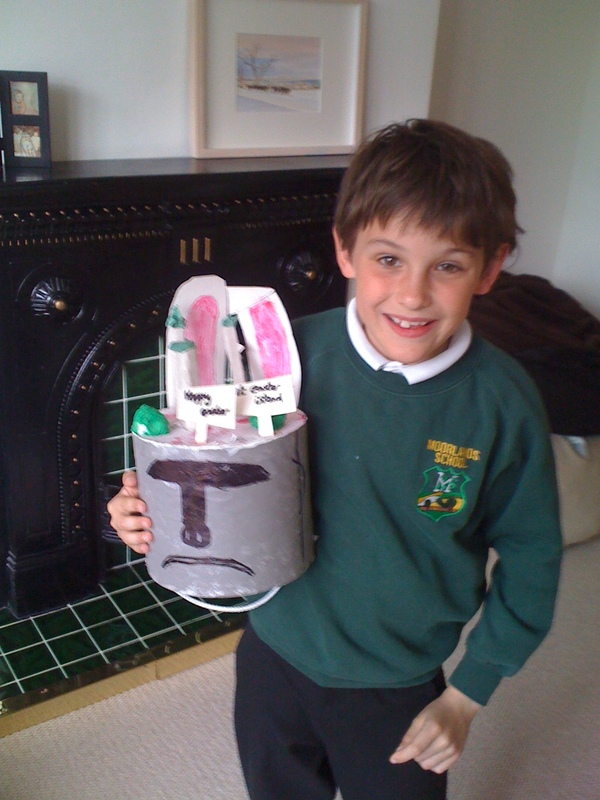 All pupils at Gabe’s primary school are given the homework task of making an Easter bonnet, which are paraded at a special prize assembly. Gabe picked on a chance comment about Easter Island and decided that would be the theme of his bonnet. Its construction involved the usual amount of angst he experiences when making something. While it featured a recognisable Easter Island stone head, in L and my eyes it lacked evidence of real commitment. Nonetheless Gabe seemed convinced it would be a winner. L received, and dismissed as a hoax, a text from a friend announcing that Gabe had received an award. Only when Gabe came home from school with an Easter egg, was the truth of his achievement appreciated. The novelty of his idea – when all around them were chicks, nests and flowers – had swung the judges. We tracked down a roller-rink in the locality, where Eliza can pursue her roller-blade passion. Situated in a warehouse on an industrial park, the rink sits anonymously, without signage to draw customers. Fittingly, then, it should be a hidden gem. A throwback to the middle of the last century – from its tiny ticket booth, to its paper decorations hanging from the ceiling, plastic covered booth seats around the rink, cheap tuck shop and most of all, its polished wooden rink. And it was a venue for skaters of all ages; many of the most elegant were of retirement age. Eliza herself was as much a spectacle. She has an easy, graceful style. But what strikes most are her spindly, stick legs rising from her chunky boots with blades. She is much less fragile than she appears, but the worry remains. Robin is progressing well at school and showing a facility for learning. Yet, there remain some odd blind spots. Whenever he reappears in the room after a trip to the loo, L or I ask whether he has flushed and washed his hands. He pauses, before trotting back to complete the task that continues to seem just a little beyond him. Gabe took the grade 1 piano exam and passed with a merit. As well as a stage for demonstrating his musical talent, the piano has become a bellweather of Gabe’s tempers. He will turn to the piano when frustrated and pound out one or both of the pieces studied for his exam: Tarantella and Gavotta. His nervous energy is channeled into his fingers tapping out the tune of one of these pieces when sitting watching tv, eating a meal, or even holding hands walking to school. The arrival of Coco has stimulated in Robin a desire to have a rabbit. For a couple of weeks, he has asked regularly (hourly, at times) when he’ll be old enough to have a rabbit. The answers L and I provide do not satisfy and he turns grumpy. There’s a genuine desire there, which we’ll find hard to resist. One night, Robin etched with biro a rabbit on the headboard of his bed. Soon after her night-time trip to the hospital, Eliza’s coughing started up again. A few causes were considered: Coco, pollen, plain old viral infection. The GP was clear – asthma – meaning that she joins her brothers with that diagnosis.